SINGAPORE—A Singapore mass transit train collided early on Wednesday, Nov. 15 with another at a station, injuring 25 people, authorities said, the latest incident involving the city-state’s railways. Transit operator SMRT said 23 passengers and two staff suffered light to moderate injuries and have been taken to hospital. 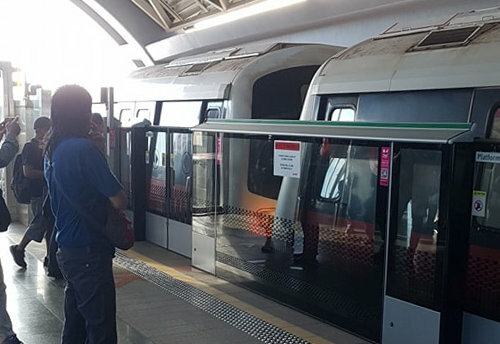 The incident took place at 8:20 AM local time, SMRT said in a statement. It said a faulty west-bound train had stalled at Joo Koon station on the system’s East-West line at 8:18 AM. A second train stopped behind the faulty train at the station at 8:19 AM but moved forward unexpectedly a minute later, coming into contact with the stationary train. The mishaps led to a rare public apology by top transit executives. The densely-populated city-state is highly dependent on public transport. It is one of the world’s most expensive places to own a vehicle and recently announced that it will not allow any net growth in its car population from February next year.